Obituary – Albin, Frances Marguerite (Frazier) « Perry High School Alumni Association, Inc.
﻿Glee Club, Perryscope, Debate, Girls Reserve, Blue Curtain Dramatic Club. Marguerite Frazier Albin passed away March 15, 1997 in Stillwater, OK. She was born on December 15, 1909 in Walters, OK. to parents William & Ada Frazier. She married E. Boyd Albin on March 21, 1937 in Perry, OK.
She attended schools in Perry and received a Bachelor’s Degree in Education from Phillips University and Oklahoma A & M. She taught school at Lawnview rural school in the spring of 1938 and other schools until 1942 and was a substitute teacher from 1948 to 1954. After her husband Boyd’s death in 1958, she returned to teaching until retirement in 1972. In 1974 she started Cowboy Corral, a daycare center in Stillwater retiring from the daycare business in 1985. She taught piano from 1985 until 1991. 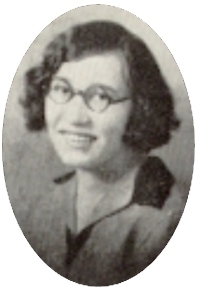 Marguerite is survived by seven children; four daughters Elaine Smith and husband Bobby of Beaumont, TX, Bonnie Gingras and husband James, Dorothy Tate of Stillwater, Donna Denton and husband Clyde of Borger, TX and three sons Emmett Boyd Albin, Jr. and wife Susan, Chris Albin and Ronald and wife Christine along with a number of grandchildren, nieces and nespews. She was preceded in death by her husband of 21 years Boyd Albin and her parents. Marguerite’s funeral was held at 2:00 pm, Tuesday, March 18, 1997 in the Chapel of Strode Funeral Home in Stillwater, Oklahoma. The Reverend Tom Moll officiated with burial following in Fairlawn Cemetery in Stillwater.